Outside of my annual summer vacation, one of the things I most look forward to when the weather turns hot is the International Startup Festival, returning to Montreal from July 10 to 13 for a third great year. I chatted this week with Phil Telio, the festival’s maestro, to get a preview of what the startup entrepreneurs, investors, support community members and general hangers-on (like me) can expect from this year’s edition. The festival is moving out of the cruise-ship terminal that housed it for its first two years in favour of the Montreal Science Centre and adjacent parkland. While both old and new venues are near each other on the city’s storied waterfront, the new park setting will let the festival greatly expand the number of tents it can accomodate. 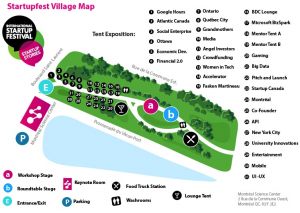 Last year’s introduction of a tent expo was very popular and this year’s relocation will allow that to expand from nine to 40 tents housing everything from sponsors, investors and mentors to pitch tents, theme-based tents and tents representing the cities of Montreal and New York. Besides the open house, a second extra day has been added to the front of the formal session with what Telio called “premium content.” One is a day-long workshop on lean methodologies, while the second is a rally for startup accelerators. Both events have their own separate cost and registration processes. The festival’s approach to programming is also changing a little. Whereas the last two editions saw two stages, Inspiration and Execution, on the go at all times, this year will see the big keynote speeches and other critical events take place indoors at the science centre while the rest of the sessions will be divided between two stages in a large tent outdoors. “We’ll still have the Execution stage,” Telio said, focusing on “how to” do all the things necessary to make a startup successful. The second stage, meanwhile, will feature a series of roundtable discussions, something Telio said people have been telling him they wanted to see more of. With no physical elevator available in which to conduct the festival’s popular — and literal — elevator pitch contest, startups will have to do their pitching in one of the pitch tents in the tent expo. As in previous years, they can also do their best to impress a gaggle of grandmothers who have a perfect two-for-two record in selecting a startup that went on to land investment. Between these pitching opportunities and formal on-stage company pitches, there is the opportunity to win $60,000 in “entrepreneur-friendly” convertible debenture investment from six investors who have kicked in $10,000 apiece, plus a prize package of legal, marketing and other services that Telio valued at another $20,000. Some of those hoping to snare that prize will be part of organized travel delegations. Last year saw a “startup train” bring entrepreneurs and others from Toronto and surrounding communities. This year, there will be two trains and three buses, each featuring some sort of programming for the startups who ride along. Trains are coming from Toronto again as well as from Quebec City while buses will be dispatched from New York, New Brunswick and Ottawa. With just under two weeks to go before the festival formally kicks off with a party on the evening of Wednesday, July 10, Telio was reluctant to make any predictions about turnout. “We always shoot for as many as we got last year and we always get more than that.” This year’s attendance is on track, he said, to match last year’s 1,200. This will be my third year at the festival. In addition to my usual heavy tweeting and networking and a round-up post here, I’ll also be blogging each day for IT Business Canada. See you in Montreal, I hope.